Credit: Adric Riedel/CUNY Hunter College/American Museum of Natural History. Unlike many galaxies, our Milky Way spawns lots of new stars. To study these stellar infants, observers often peer across vast distances to places such as the Orion Nebula, a star-making cloud of gas and dust 1,350 light-years away. 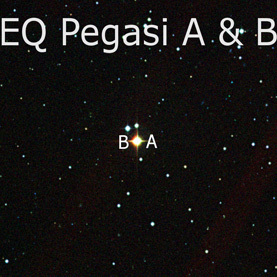 Now astronomers have discovered that a nearby pair of red stars named EQ Pegasi is so young they shine primarily from the heat of their formation rather than from nuclear reactions. The discovery may give observers the chance to glimpse the glow of newborn planets, because EQ Pegasi is just 20 light-years from Earth—less than five times the distance to Alpha Centauri, the nearest star system. Read more at Scientific American. Ken Croswell earned his Ph.D. in astronomy from Harvard University and is the author of The Alchemy of the Heavens and The Lives of Stars.